In an effort to enhance security and help protect member information, Americo Federal Credit Union Debit Mastercard & Credit Cards now feature built-in chip technology. The embedded chip allows all the same functions your old card had to offer, plus an extra layer of security when used at a chip card reader. A chip card is a standard-size plastic debit or credit card that contains an embedded microchip as well as a traditional magnetic stripe. The chip encrypts information to help increase data security when making transactions at terminals or ATMs that are chip-enabled. When will I get my new card? Americo will be issuing EMV cards as they expire or are lost/stolen. How is an EMV transaction different from a traditional swipe transaction? Instead of going to a register and swiping your card, you are going to do what is called ‘card dipping’ instead, which means inserting your card into a terminal slot and waiting for it to process. When an EMV card is dipped, the customer must leave the card in until the transaction is complete. Data flows between the card chip and the issuing financial institution to verify the card’s legitimacy and create the unique transaction data. This process isn’t as quick as a magnetic-stripe swipe. So if a person just sticks the card in and pulls it out, the transaction will likely be denied. A little bit of patience will be involved. Why does a chip card still have magnetic stripe? Your new chip card has a magnetic stripe, so you can continue to swipe the card at merchants that do not have chip-enabled terminals to make payments the same way you do today. How does EMV help protect against fraud? EMV cards protect against fraud by ensuring unauthorized users cannot access member data. EMV cards carry security credentials (known as keys) that are stored securely in the EMV card’s chip. These keys help prevent skimming and card cloning. Can I use an EMV card online or over the phone? 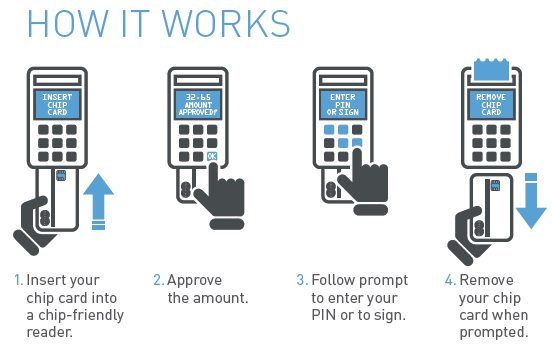 Yes, you can use your EMV card for payment over-the-phone or online just like you always have. YouTube is not operated by the credit union. Americo Federal Credit Union is not responsible for the content or availability of linked sites. Please be advised that Americo Federal Credit Union does not represent either the third party or you, the member, if you enter into a transaction. Further, the privacy and security policies of the linked site may differ from those practices by the credit union.